As I’m feeling a little under the weather with a flu bug, I’m not feeling particularly creative today so I thought I would chat a bit about a project I’m just starting. 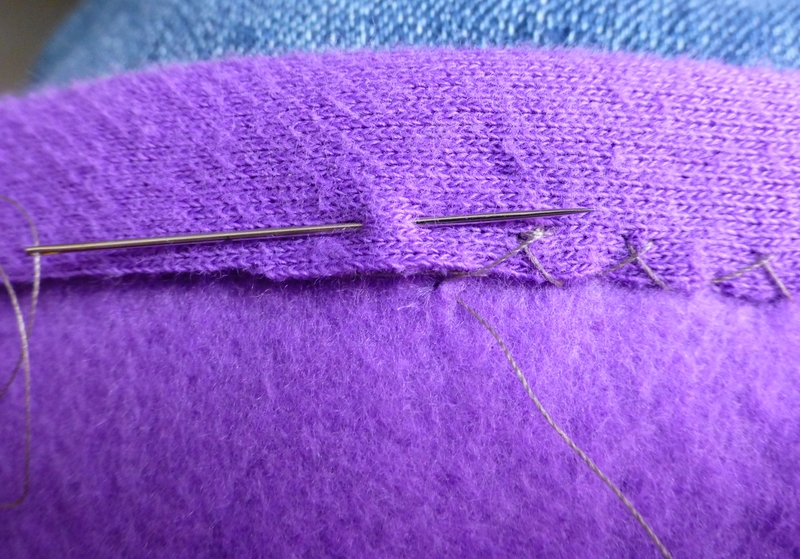 I’m always on the lookout for quick and easy projects that I can share with friends who are not as comfortable with a needle and thread as I am. While RVing, the wardrobe basics are jeans t-shirts and sweatshirts. I’ve resisted wearing plain un-embellished sweatshirts and have altered each season’s new shirts with varying success and don’t particularly like the ‘resort style’ sweatshirts that are so popular at winter destinations. 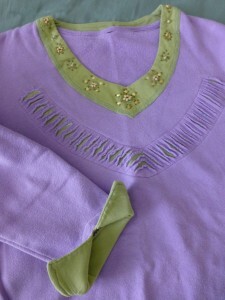 In the following examples, #1 – ribbing removed to narrow band which was stretched and overcast to ruffle; #2 – embellished with beaded neckline of old t-shirt & turn-back cuffs, slashed with reverse applique; #3 – slash design technique over reverse applique, I’ve taken a more subtle approach. 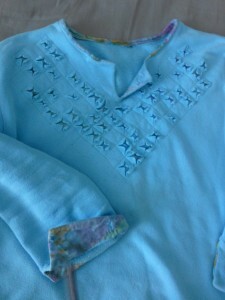 Over the last year I’ve been watching for new ‘sweatshirt’ up-cycling ideas and decided to try a couple of the ideas that I had gathered. I’ve started on the first one – turning a pull-over sweater into a jacket – without using a sewing machine. I’ve searched for someone to credit with the idea but come up with no internet links. The instructions were shared with me by a camp host at one of the state parks and are simply entitled Nancy Brown’s Sweatshirt. If anyone knows ‘Nancy Brown’ or can provide contact info I’ll be sure to ask forgiveness for posting my interpretation of her pattern. 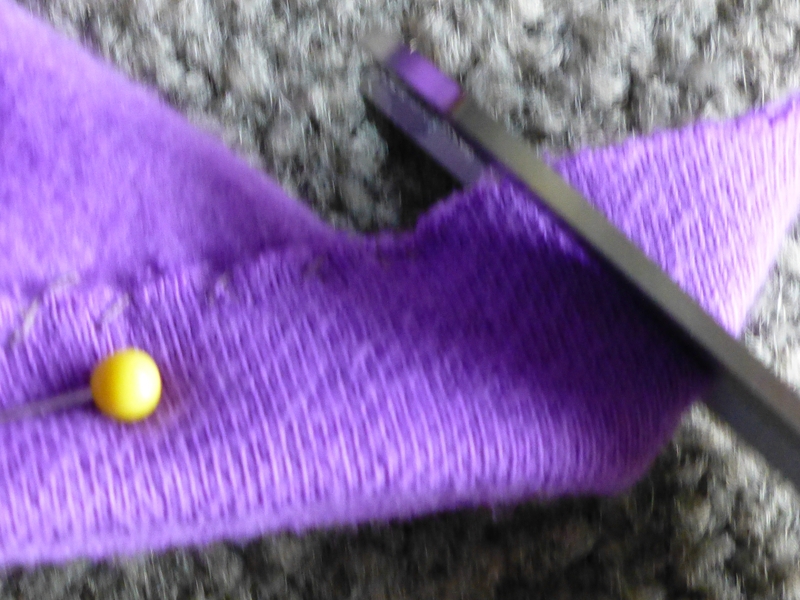 This time I’m making a cardigan from a pull-over sweatshirt. 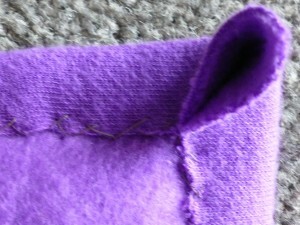 To do this, I started by removing the ribbing from the bottom of the sweatshirt. 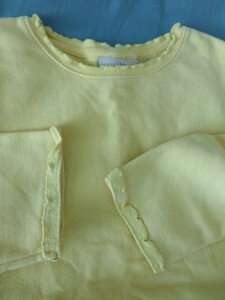 I pinned the centre front line after matching neckline, shoulder and side seams and cut along the line marked by the fold. 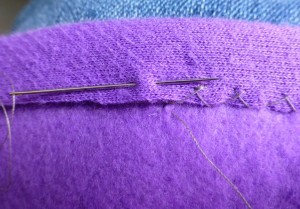 The next step was to turn under 3/4 to 1 inch along all the cut edges, and to hand stitch it in place. I used a favorite hemming stitch to do this as it doesn’t produce noticeable indentation on the right side of the garment. That’s as far as I got yesterday before yet another bout of coughing drained the last of my energy. Let’s see if this flu bug can ‘fly away’ tomorrow and I can get back to some projects tomorrow.